I am deeply grateful to have studied and trained in the Integrative Yoga Therapy system of Yoga as designed by Joseph LePage. Recently back from another level of training in Pranayama and Mudra work, I am excited about recording the lesson plans I am putting together for my students. I want to give credit to my teacher, Joseph and his wife Lilian, for the inspiration and use of their years of study with the mudras and the affirmations they apply with them. Underneath the surface activity of our mind and all it’s thinking is a deep place of stillness that reflects our essential nature of pure consciousness. This calm, quiet place is accessible to us through the tools of asana, pranayama and mudra. Below you will find a yoga practice designed to encourage a sense of embodied stillness that supports lowering overall stress level and producing a deep state of serenity in the practitioner. 1.Start in lying down in the resting pose. Feel the support of the solid ground beneath you and listen. 2. 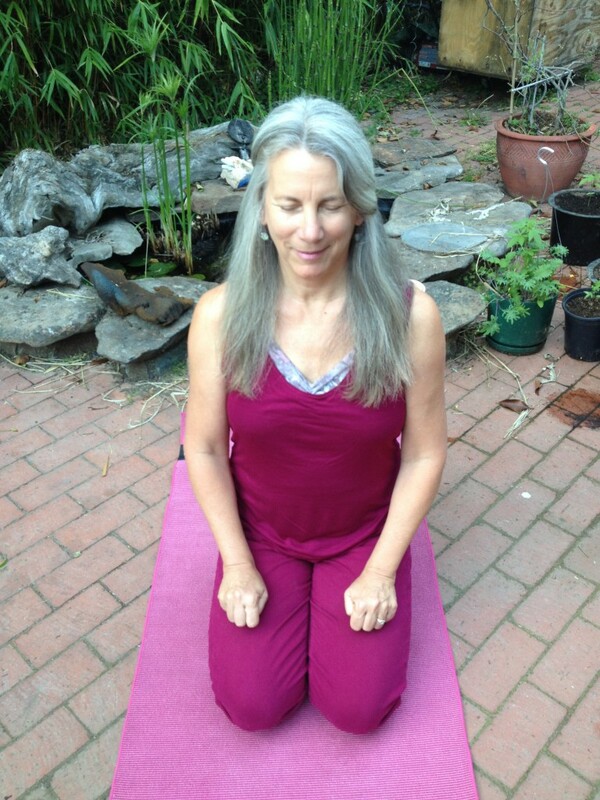 Move up to seated on knees if comfortable or another modified sitting pose that works for your body. Bring hands into Adhi Mudra (tuck thumbs in and place the other fingers over the thumb) or if you have low blood pressure use Chinmaya Mudra (let thumb and index finger touch , fold the other three fingers down into gentle fist) Sit with hands in mudra on lap and just listen and observe the natural breath. 3. Roll neck in both directions a few times slowly and mindfully, coming into connection with the muscles of the neck that move the bones. Feel the sense of connection to how our muscles move the bones in our head and neck and send some friendly , caring thoughts to the area. 4. Move shoulders in circles. First, inhale up the front , over and exhale down the back for 3 rolls and then reverse, up the back on the inhale , over and exhale down the front for 3 rolls, in synch with your breath. Ending with a roll inhaling up, over and exhaling relaxing them down the back. 5. Sit still again with hand mudra, observing the stillness underlying the activity of the mind. 6. Move onto all fours for table pose and begin to inhale into the hollow back(cow) and exhale into the rounded back (cat) watching and following from the moment the pelvis does the tip through the spine to the head. 3-5 rounds and then begin to lean back towards heels on the cat movement and move a bit forward into the cow movement. Thus, creating the circular spinal wave flow. 3-5 rounds ending down in child’s pose. 7. In child’s pose , hold mudra, breathe and listen into the space of stillness. 8. Stretch arms out into extended child’s pose. Actively reaching through fingers, with elbows lifted and head in line with the spine for 3-5 breaths. Then walk finger tips , arms and torso toward right side until you feel a gently opening of your left side body. 3-5 breaths. Then walk through to the other side and repeat for 3-5 breaths. Come back to middle and relax for a few breaths in the quiet and stillness, recognizing the movement in the stillness of heartbeat, blood flow, life going on outside. 9. With arms extended, on an inhale lift to table pose with rounded back and then exhale lowering yourself down to floor, thighs, belly, chest, chin. Bending elbows to support the lowering and keep them near your ribs. Inhale pushing back up to table and exhale back to child’s pose. Repeat the flow 3-5 times as a 4-part breath flow. Pay attention to details of sensation, noticing the subtle differences each time. Ending back in child’s pose holding mudra. 10. With arms extended, on an inhale lift to table pose, on exhale tuck toes and push gently back to downward dog, on inhale bend knees back to table pose and exhale into childs pose. Repeat 3-5 times, appreciating your body and its ability to move you through life with strength and ease. End the flow from downward dog, walking into forward fold or hopping. 11. Start with a relaxed rag doll type feel in the forward flow and slowly come to stillness in the pose. Recognizing the stability of the legs and feet rooting gently in the floor and 3 times sigh out on the exhaling breath. End by bending the knees a bit and rounding up to standing. 12. Stand with parallel feet and lifted heart holding mudra for a few breaths, sensing the body standing in stillness. Allow the image of a mountain appear in minds eye. At first seeing all that goes on the surface of the mountain-plants, shrubs, trees, grasses growing, insects buzzing,rodents scurrying, animals grazing, waters flowing, etc. Then attune to the deep inner stillness of the mountain. Feel the stability, steadiness and strength of that stillness Acknowledge how our practice in stillness has potential to bring that strength, stability and steadiness to your own being. 13. Bring hands to heart in Anjali mudra. Feel the stillness touch the heart center, joining, feeling the embrace of the silent space. Begin to flow arms up on an inhale out to sides and up over the head and then exhale swan dive down, with soft knees, to forward fold. Inhale lift up half way with a flat back and exhale flow back to forward flow. Inhale, firm feet into ground and swan dive back up and over the head with arms and exhale back with hands in Anjali Mudra at heart. Repeat 3-5 times ending down in forward fold for a few breaths. Recognize the benefit of the inversion of your head below the knees, as it brings the blood flow to the brain and bathes it with nutrients from the blood. 14. Inhaling , step back the right leg to a lunge(choosing to put the knee down or to keep back leg up) Align knee over ankle and keep gentle connection with big toe line on bent knee. Lift heart and draw shoulders down the back resting the fingertips on the floor or have blocks on either side of front foot to put fingertips on. Hold for 3-5 breaths and then begin to pivot on your feet to turn into wide-angle forward fold. 15. Settle into your wide angle forward fold for 3-5 breaths feeling balance between ball and heel of feet, right and left leg. Lift up to fingertips or onto block with fingertips , moving into a flat back. Breathe 3-5 breaths and then release down to forward fold again. 16. Begin to transition to the other lunge with the right leg as the front leg in your pose. Hold for 3-5 breaths, and observe what sensations present themselves and adjust accordingly to your body cues to find a sense of ease in the effort of the lunge. Begin to transition back to your wide angle forward fold again. 17. Keep feet and legs rooted and stable, bringing torso and hands towards right foot , holding side of right foot or shin with left hand. Let your head rest against the left arm. Hold for 3 -5 breaths and then do same on other side. As you come back to middle , heel toe the feet into forward fold or hop. Stay for 3-breaths sighing on the exhalations. Soften knees, bending slightly and round up to standing. 18. Create parallel stance with lifted heart and head. Rest in the stillness of your mountain pose again for a few breaths. Holding Adhi mudra or Chinmaya mudra, be present to all the sensations occurring, feeling the stability provided by the earth and the serenity emerging from the calming energy of stillness. 19. Preparing for standing balance, or tree pose, decide if you want to be by wall for some support. When ready, shift weight to right foot, bend left leg and put the sole of the foot either up high on right inner thigh or below knee on right calf. Bring hands to heart. When and if feeling stable, bring arms up overhead to create the branches of your tree. Sense and create the balance between rooting down and extending up. Hold for 3-5 breaths and then step down, standing on both legs. Reflect on the movement of the energy(prana) within the two sides. Remembering that yoga practice is designed to awaken your awareness to the movement of energy through the 72,000 points (nadis) inside you. Do your other side, ending back in standing. 20. With both feet aligned parallel , hip distance apart, inhale arms up to shoulder height and exhale bend knees, drop buttocks down as if going to sit in a chair and then hold there in chair pose for 3-5 breaths. Knees parallel, lower belly and solar plexus lightly pulling in toward the spine to support it. Feeling the balance back on both legs and centering there. End by either moving down into a squat balance on the balls of the feet with hands at heart in Anjali mudra. Or release to floor coming to your tummy if knees don’t allow you to squat. 21. Lie on tummy with your arms bent at elbows with one palm on top of the other so your forehead can rest comfortably on top hand. Let the body settle completely on the front side so you can rest for a moment with the solidness of the earth energy that evokes a deep stillness of being. 22.Lift your head and chest , bringing your forearms underneath you to set the body into a sphinx pose. The elbows align directly under the shoulders and the forearms turn down allowing the palm of the hands to rest downward on the floor. Energize very gently the lower half of your body by lightly pressing your pubic bone to the floor and stretching down through the tops of your toes. Press firmly, but gently down through your whole forearm from elbow to palm evenly and let the heart slide up and forward a bit , allowing the shoulders to relax down the back. Hold steady and breathe for a few breaths imagining the image of the statue of the sphinx in front of the pyramids. If the body feels straining , lower yourself down and then come back into the pose again. Finish lowering down and resting back with head on top hand again. 23. Move the body back into child’s pose (or if knees are unhappy onto your back with knees up) for a rest with adhi mudra or chinmaya mudra. If it feels right, repeat this affirmation to yourself 3 times: I am fully present in my body; it is a sacred vehicle for my life journey. 24. Round yourself up from child’s pose and move into a wide angle sitting position. Taking care of the lumbar curve by putting more height under your sitz bones if you need it to feel comfortable upright. Sit with hands in the mudra for 3-5 breaths allowing the small muscles along the spine to strengthen. Feet and knees are upright rather than tilted in external or internal rotation from hips. 3-5 times take an inhale through the nose and exhale through your mouth(with the mouth in a beak shape). Notice the breath allowing for a deeper connection to your pelvic floor as it settles down at the ground. 25. Release forward from the hinge of your hips and let the hands come to floor in between the legs. Hold and breathe a few breaths there. Focus on a nice even flow of breath through the body as you hold. Focus on a sense of deep presence with your bones and muscles of this position. 26. As you did earlier in wide angle standing, allow the upper body to move towards the right leg taking hold of your foot or side of the calf. Hold for 3-5 breaths and then gently transition to the other leg for 2-5 breaths. Come back into middle for another few breaths and then come back to upright. 27. Fold the legs at the knees bringing the soles of the feet together for a seated cobbler position. Hold around toes, ankles or shins so that you can comfortably sit upright. Staying relaxed in the legs for this variation. Imagine a lake with some waves and ripples , watch them calm, leaving the surface still , noticing you can see clearly to the bottom. Reflect on how stillness supports clear seeing, clarity. Listen and allow answers to arise naturally that may be helpful for any difficulties or issues that have been up in your life. 28. Bring the knees upright and together and slowly round yourself down to your back bringing the knees to the chest to rest for a moment there. Let the knees slowly sway side to side and move them in slow circles around the sacrum both ways a few times. Send some love to your back and give it some self-massage. 29. Bring the knees to center and arms to t-position. On an exhaling breath lower your knees towards the inner arm to the right for a gentle twist. (Propping below the lower knee if needed for your back to be comfortable) Set the right hand gently on the left knee and stay for 3-5 breaths. Let the inhale flow into the upper chest fully and sense a dissolving of tension from the upper back, neck and face as you exhale. Sense a deep immersion into stillness. Then, using your belly muscles to support you, pull knees in and up to center. Repeat going to the left side. 30. Back in center on back with knees at chest, simply lift the legs straight up in the air and hold for a bit. Choose to put your arms either down by your sides, out in T-position or up overhead. Put the hands into the mudra. Allow for the blood flow to invert here for as long is comfortable, and then slowly lower the knees back into the chest. Then put the feet back on the floor and have arms at your sides. Pause and feel for a moment, is there any last movement your body needs before laying out for resting. 31. Lay the body out comfortably and warm enough to rest deeply for 7-10 minutes. As you give your body full permission to let all the muscles relax around the bones and rest on the solid ground, acknowledge the miraculous quality of self-healing that occurs within the body and all its systems while you rest. Feel back into the great silent space that hold all of nature in its embrace and also holds you.